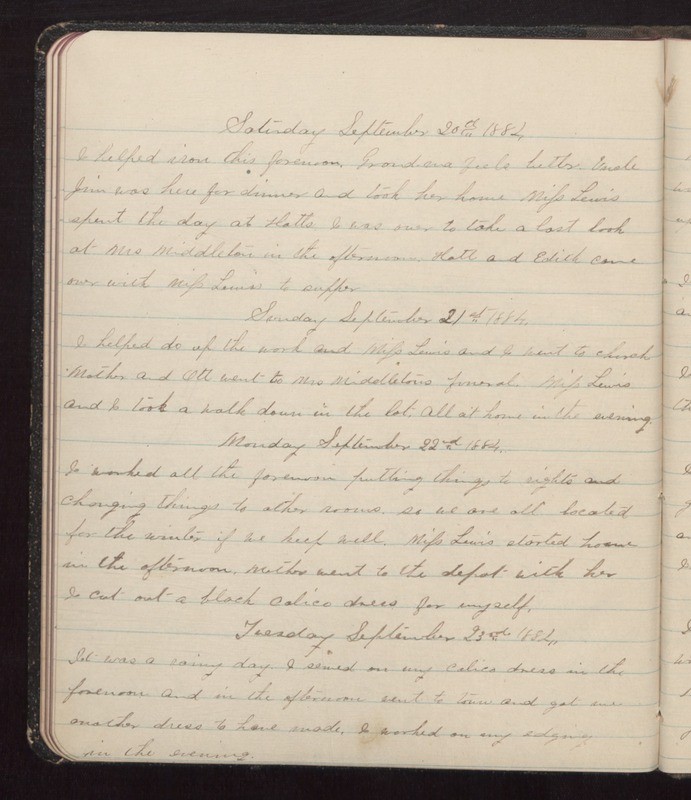 Saturday September 20th 1884. I helped iron this forenoon. Grand-ma feels better. Uncle Jim was here for dinner and took her home. Miss Lewis spent the day at Hatts. I was over to take a last look at Mrs Middleton in the afternoon. Hatt and Edith came over with Miss Lewis to supper. Sunday September 21st 1884. I helped do up the work and Miss Lewis and I went to church. Mother and Ott went to Mrs Middletons funeral. Miss Lewis and I took a walk down in the lot. All at home in the evening. Monday September 22nd 1884. I worked all the forenoon putting things to rights and changing things to other rooms, so we are all located for the winter if we keep well. Miss Lewis started home in the afternoon. Mother went to the depot with her I cut out a black calico dress for myself. Tuesday September 23rd 1884. It was a rainy day. I sewed on my calico dress in the forenoon and in the afternoon went to town and got me another dress to have made. I worked on my edging in the evening.